Lucy Andrews makes assemblages using found objects, domestic detritus, and various household liquids. Through instinctive processes of experimentation, base materials are separated from their original functions and begin to reveal a hidden agency. While the original connotations of substances such as washing up liquid, highlighters and nail varnish are not concealed, their visual and sculptural properties are playfully tested. The resulting art works often act as vessels in which various elements are allowed to react with each other and are subjected to temporal and physical phenomena. Lucy Andrews was born in Stoke-on-Trent, England, and now lives and works in Dublin. She graduated in 2011 from NCAD with a BA in Fine Art and History of Art, having also studied at the University of Applied Arts, Vienna and she is currently completing an MA at IADT. Recent exhibitions include: Here and There at Artlink, Donegal, (2011), Gracelands: Substance Abuse (2011), Transitive Relationships at Limerick City Gallery (2012), As Above So Below at 126, Galway (2012) and A Macguffin and Some Other Things, Project Arts Centre (2012). She was recently awarded the Temple Bar Gallery and Studios Graduate Residency. Peter Burns makes paintings and objects in a variety of materials. The paintings have sculptural elements and the objects are strongly linked to the practice of painting. He has a very tactile and experimental approach to his work. In the paintings chunks of old dried oil paint are often attached to the canvas while in other areas paint is scraped off to reveal underlying layers. The objects are made using ephemeral materials such as wax combined with found objects. They are painted, small in scale and often fragile. In the paintings people are shown in relation to nature and the universe. Small figures and animals exist and roam in painted worlds. The inspiration for these works originates in his interest in literature, art history, myth and allegory amongst other things. Peter Burns’ work has been described as rhizomatic, suggesting an organic practice, growing through a gradual accumulation of marks and taking myriad forms, producing works without a definite beginning or end. Peter Burns studied at NCAD where he graduated with a degree in Sculpture in 2001 and completed a Masters in Fine Art Painting in 2009. Solo exhibitions include Fendersky Gallery, Belfast, The Wayfarer, nag, Francis Street, Dublin, Cross Gallery, Dublin, Can Serrat, Barcelona and Sojus, Berlin. He has also exhibited in several groups exhibitions including 182nd RHA Annual Exhibition, Dublin, Last Douglas Hyde Gallery, Trinity College, Dublin, The Living Skull, Fenderesky Gallery, Belfast, None Went Mad…None Ran Away, Rubicon Gallery, Dublin and Bizarre Bazaar, Pallas Contemporary Projects, Dublin. Caoimhe Kilfeather’s work is predominantly sculptural and is informed by a range of interests including architecture, ornamentation, proportion, relationships between formalism & functionalism, the hand-made & mass-produced object and the aesthetic and formal potential inherent in particular materials. Much of the work results from her interest in the experience of the material traces of production; of a world composed of the aesthetic residues of times long since passed, those recently faded from memory, and those of the here and now. In this, the idea of legacy is of interest to her: legacies of forms, materials, systems and methods of production and of how these things comprise our experience of normality and familiarity in the world. The work is developed through a studio-based practice. The act of engaging with materials and developing forms in an open and exploratory way is central to this. In the realisation of her work there is a belief in the fundamentality of the material, and of the experience of seeing and feeling real things in real space. Caoimhe Kilfeather studied at NCAD and the Slade School of Fine Art, London. Recent exhibitions include Swimming in the field, Goethe Institute, Dublin, Holding Together, the Douglas Hyde Gallery, Dublin, Splith, 126, Galway, ev+a Limerick, Faydun Bites, Agency Gallery, London and Broadcast Here, Dublin. She is the recipient of numerous Arts Council Awards: Bursary (2009, 2010), Travel and Training (2005, 2006, 2007), Projects Award (2006); an AHRC Research Scholarship (20017) and a UCL Scholarship (2005) She teaches in the Sculpture and Combined Media Department at the Limerick School of Art and Design. At the beginning of this year Ed Miliano began making a visual diary, painting one picture every day of the view outside his studio window. The view is of a cultivated landscape of mature trees and planting. He treated the project with the discipline of a daily routine and stayed in Ireland the entire time. The paintings reflect the seasonal change, weather and time. When viewed together, the pictures create a collective landscape. Ed Miliano was born in New York in 1954. He received a BFA in 1976 from Pratt Institute in Brooklyn, NY. Before becoming a full-time artist, Ed worked for over twenty-five years as a designer and illustrator in the USA and Ireland. This experience continues to influence his work, especially in the design of his pictures. He has exhibited in many group exhibitions, including the 2006 and 2007 RHA Annual Exhibitions. In 2004 he exhibited Flower Paintings at the National Botanic Gardens in Glasnevin. Ed lived in Tanzania from 2007 until 2010. He now paints out of his studio in Dun Laoghaire, Co Dublin. Jim Ricks aims to disrupt, rearrange and detour the bourgeois narrative. As such, his work deals with borders, ownership, commodity, institutions, identity and publics. He uses synchronicity, imitation and appropriation as a vehicle to explore these ideas. Ricks takes a ‘hands-off’ approach and finds his art in the combination, imitation and collection of existing things. His work can be seen as a semiological investigation into context, knowledge, disintegration and the contested territory between the ‘manufactured’ and the ‘authentic’. By openly imitating art and life through available means and materials he explores the grey area between flattery and theft, while re-wiring history into a new narrative. Ricks’ work is also influenced by his background as a prolific graffiti artist and a political activist. Born in California, Jim Ricks has resided in Ireland for seven years. He earned his MFA from the National University of Ireland, Galway/Burren College of Art programme and received his BFA from the California College of the Arts. Ricks continues to tour the collaborative public work In Search of the Truth (The Truth Booth). He recently showed 99%4ART in The Shed, Galway and curated Death and Sensuality, San Francisco for Imagine Ireland. In the last two years Ricks has created the touring public work Poulnabrone Bouncy Dolmen and had solo shows at Peanut Gallery, Chicago, Occupy Space, Limerick and Pallas Contemporary Projects, Dublin. Upcoming shows are at the Black Mariah, Cork, Breezeblock, Portland, Static, Liverpool, Tactic, Cork, Monstertruck, Dublin and Ennistymon Courthouse Gallery, Clare. Stephanie Rowe utilises film as an entry point into her subject matter. 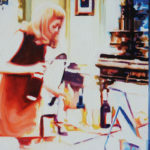 Through a process of heavy-handed technological filters she creates stills from which she works to make her paintings. Her intended cross pollination of film and paint is driven by notions of the real, the staged, temporality and cultural memory. In addition to content, formal considerations are also at the forefront of her investigations, subject and treatment of colour are key, representational as well as painterly styles employed. In these re-directed scenes, objects and figures are often added or removed. Colour palettes shift, lighting is reworked, shading and composition rearranged. Stephanie Rowe, resident in Ireland since 2005, is a Canadian born Visual Artist. In the spring of 2005, before relocating to Dublin, she graduated from the Emily Carr University of Art and Design in Vancouver British Columbia. Recently she was co-awarded the Hennessy Craig Scholarship.FUTURES 12 is the fourth in the present series of Futures, a sequence of exhibitions that endeavours to document and contextualise the work of a selection of artists, around whom exists a growing critical and curatorial consensus. Stephanie Rowe, Untitled, 2012, Oil on panel, 10 x 13.5cm. Image courtesy of the artist. Peter Burns, Heads, 2011, mixed media. Image courtesy of the artist. Lucy Andrews, The Law of Contagion, 2012, rock wool insulation, washing up liquid, electric foot spa, timer, dimensions variable. Image courtesy of the artist. Caoimhe Kilfeather, In plain existence, 2011, carved, polished coal, 40 x 35 x 65 cm. Image courtesy of the artist. Jim Ricks, The Poulnabrone Bouncy Dolmen, 2010, 20’x25’x14’. Image courtesy of the artist. Ed Miliano, Diary 05 October, 2011, oil on paper. Image courtesy of the artist.